The Kalibr-M will be deployed on Russian warships and submarines when developed. On Tuesday, Russia’s state-run TASS news agency reported that Moscow is undertaking the development of a new extended-range variant of its subsonic Kalibr (3M14) land-attack cruise missile. Citing a defense industry source, TASS revealed the existence of a Kalibr-M project. This new missile is slated to be larger than the existing ship-launched Kalibr missile, which is thought to have a range capability of approximately 2,350 kilometers. The new Kalibr-M will reportedly have a range of 4,500 km and will be deployed on Russian Navy warships. The development of the Kalibr-M is presently at an early stage, the source noted. It is likely to be deployed in the late-2020s. According to TASS, the Kalibr-M is expected to be “significantly” larger than the existing Kalibr missile, which is 6.2 meters long with a 0.43 meter diameter. Though little else is known about the new missile’s physical dimensions, it may resemble existing Russian systems like the P-800 Oniks. In terms of payload, the new Kalibr-M is likely to be both capable of nuclear and conventional payloads and may carry up to a 1 ton payload. The new missile may raise concerns in the United States about a possible land-based deployment should the Intermediate-Range Nuclear Forces (INF) Treaty of 1987 see its end this year. The Trump administration has informed Russia of its intent to withdraw from the INF Treaty, citing the 9M729 or SSC-8, a Russian ground-launched cruise missile thought to be based off the 3M14 that violates the Treaty’s prohibition on ground-launched ballistic or cruise missiles with ranges between 500 km and 5,500 km. Should the INF Treaty end, Russia would be free to explore a ground-launcher option for the Kalibr-M as well, providing it with a ground-launched standoff capability greater than that which is thought to be provided by the 9M729. According to TASS, the new missile is being developed for deployment primarily on Russian Navy frigates and submarines. 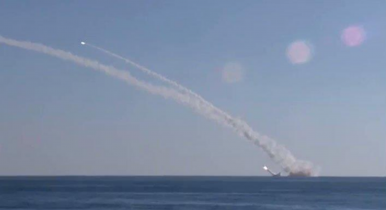 In 2015, Russian Navy used the Kalibr to strike targets in Syria from the Caspian Sea. According to Russian Defense Minister Sergei Shoigu at the time, four Russian warships launched 26 Kalibr cruise missiles at Islamic State targets in October of that year. Last year, a Russian Northern Fleet naval group was deployed off the coast of Syria in the Mediterranean armed with Kalibr cruise missiles as well.